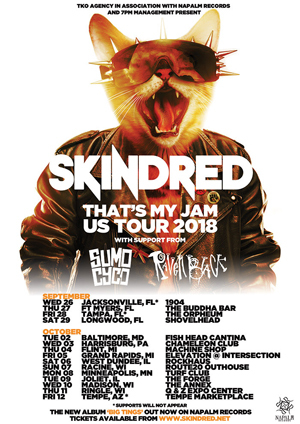 Ragga Punks SKINDRED have announced their return to North America in support of their new album Big Tings, which features the active rock radio smash "That's My Jam"- #22 on the charts this week. The tour kicks off September 26th in Jacksonville, FL and runs through October 12th in Tempe, AZ. A complete list of dates can be found below. Support on the tour will come from SUMO CYCO and RAVEN BLACK. "We are blown away by the success "That's My Jam" is currently having in America. It's heartwarming that our once second home is once again opening its arms to SKINDRED. This North American tour is so exciting for us, we can't wait to spread Big Tings across the land and so say all of us, Let's Dred into America!" Big Tings, the follow-up to 2015's Volume, is a magnificent beast churning out heavy, distortion-laden riff punches melting into vocalist Benji Webbe's frenzied rapping. Explosive rock, metal and punk material rubs shoulders with smooth melodies - and of course SKINDRED wouldn`t leave us on the dance floor without a hefty helping of their trademark Godzilla-huge choruses. Big songs, big sound, Big Tings!